Now in this post ill got a bit deeper into some of the solutions, where management and data plane are seperated. Now moving the management plane out of the equation, allows for a lot easier management, since we now only need to focus on the desktop/app servers and ensure that the way of access point is working. 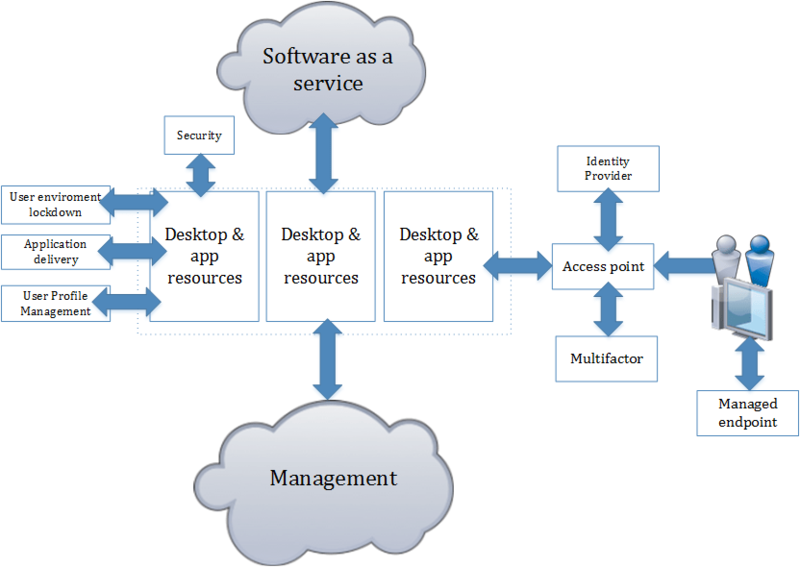 Of course there are other factors like user profile management and how to handle application delivery is we are using layers and such but this simplifies things alot further. 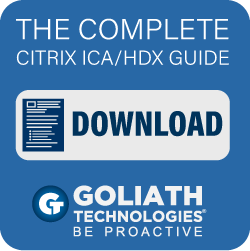 Now there are a few vendors which have this type of approach, the ones I’m focusing on is Citrix with their Cloud offering, VMware with their Horizon Air Hybrid Mode and Workspot which provides us with a cloud based management tier. So let’s dig a bit deeper! Citrix have been pushing Citrix Cloud for some time now, and their architecture reflects pretty good the picture above, Citrix provides the management plane (running in AWS for the time being) and your on-premises setup can be running on any type of hardware and you can still be leveraging PVS if you wish or you can use the built-in provisioning mechanisms which existing like vSphere, XenServer, SCVMM and so on. They also provide as mentioned integrations with AWS, Azure as well. 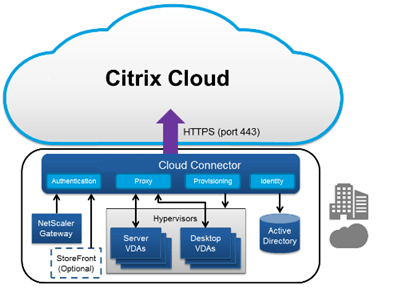 Citrix Cloud uses a Windows component called a Cloud Connector which does the interaction between the on-premises resources and Citrix Cloud. 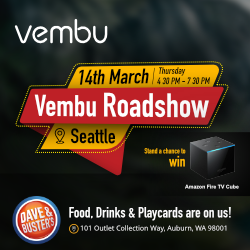 Remote access to the enviroment is granted either using the NetScaler Gateway or using their new cloud offering called NetScaler Gateway Service. 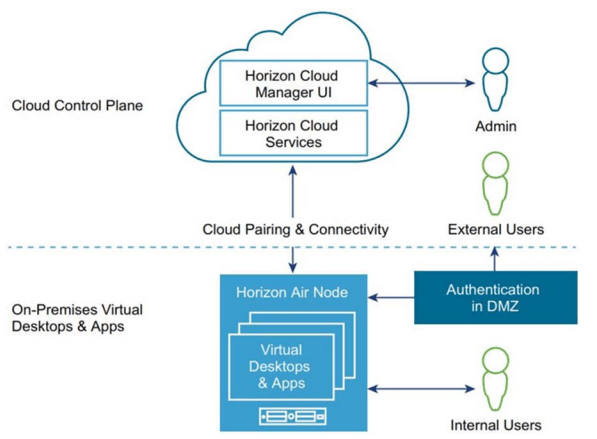 Vmware Horizon Air Hybrid mode is a new offering which provides Cloud based management, now unlike VMware has also expanded their offering and introducing the setup of an on-premises finished Horizon Air node, which is a fininshed certified appliance this is to ensure that user get consistent performance. Horizon Hybrid mode is also setup leveraging AppVolumes and InstantClones and this combined with a hyperconverged setup provides a fast provisiong process. Since it is leveraging AppVolumes it also handles the Application delivery method using layering which allows for more flexible ways to delivery. For some reason this needs to be setup outside of the Horizon Air nodes. This solution can also be leveraged with Blast or PCoIP protocol, PCoIP has a pretty long range of supported endpoints on the thinclient perspective and also VMware has alot of supported endpoint for their Horizon clients. Now Horizon Air is a bit limited in terms of supported on-premises configurations since you need to have the Horizon Air Node, which means that you cannot leverage other fininshed appliances like Nutanix or other hypervisors. Horizon Air mode can be purchased with the additional VMware compoents or that can be bought seperatly. For a concurrent user the price is ($26.00 / user / month) with a minimum of 100 users. http://vcloud.vmware.com/uk/service-offering/pricing-calculator/horizonairhybrid#/horizon_cloud they also have a named user pricing for $16.40 / user / month. VMware also have a DR option which allows customers to power on their desktops in vCloud AIR for DR purposes, important to remember that Horizon air is not available in all locations, but ill go abit deeper in the pure cloud offerings in the next post. Workspot which is a pretty new player in the market, which has been started by some of the previous PM’s for XenApp, XenDesktop and Horizon and is focusing on what they call VDI 2.0. Now unlike VMware and Citrix, they are not focusing on developing their own protocol but relying on RDP. Leveraging RDP allows for support for large type of endpoints which already have support for RDP, like thinclients, windows, mobile devices and such. They have built extensions into the protocol and added more features into the client which expands the current RDP functionality. 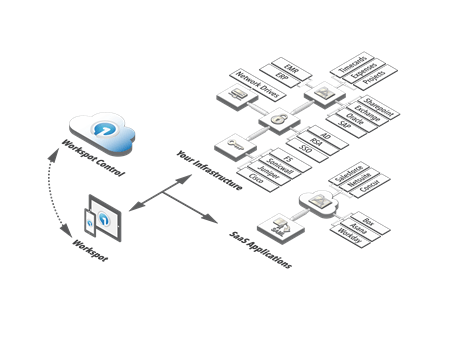 Workspot like Citrix Cloud and Horizon Air have a Workspot Enterprise Connector which runs as Windows Service to interact between the on-premises and their management plane. Also Workspot integrated with VPN appliances such as Sonicwall, Juniper, Cisco or F5 to deliver secure client access to the desktop & app delivery infrastructure. Workspot also have provisioning integration with on-premises platforms like Nutanix, System Center and VMware. Now Workspot does not have any pricing published on their website so its difficult to say if its cheaper or more expensive then the other options.